The TQA challenge encourages work on the task of Multi-Modal Machine Comprehension (M3C) task. The M3C task builds on the popular Visual Question Answering (VQA) and Machine Comprehension (MC) paradigms by framing question answering as a machine comprehension task, where the context needed to answer questions is provided and composed of both text and images. The dataset constructed to showcase this task has been built from a middle school science curriculum that pairs a given question to a limited span of knowledge needed to answer it. The phenomenon explained and tested on in middle school science can be fairly complex, and many questions require more than a simple look-up. Complex parsing of the source material and reasoning are often both required, as is connecting information provided jointly in text and diagrams. Our experiments have shown that extensions of the state-of-the-art methods from MC and VQA perform poorly on this task. New ideas and techniques are needed to address the challenges introduced by this dataset. At a high level, the M3C task is to read a multi-modal context along with a multi-modal question and provide an answer. VQA tasks typically require common sense knowledge to answer many questions, in addition to the image itself. In contrast, the this task is meant to be self-contained. All of the information needed to answer a question is included in the context. 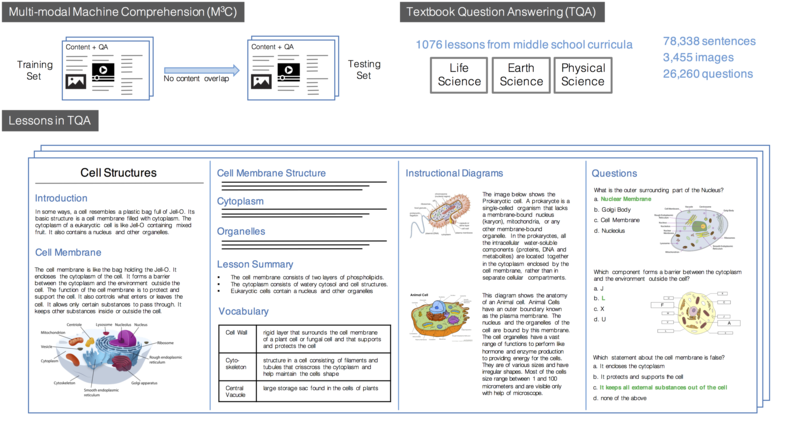 The TQA dataset consists of two types of questions: Diagram Questions and Text Questions. These questions are distinguished by the modalities of a context needed to answer them. Diagram Questions need an accompanying diagram to answer in addition to the the text and diagrammatic content in the context. Text Questions can be answered with only the textual portion of context. Separate leader boards are maintained for performance on Diagram and Text Questions, and winners will be declared for both. Diagram and text questions are easily separated in the dataset, and details for doing so are given here. Researchers are greatly encouraged to submit a model that works well on both types of questions. For the textbook question answering competition, accuracy is used as the evaluation metric. Separate leader boards are kept for performance on text-only questions, as well as diagram questions. "Question_ID": "letter corresponding to answer choice"
where the Question_ID is the global key of the question being answered, and the value is a lowercase letter denoting one of the multiple choice answer options for that question (e.g. a, b, c, ... ). The filename should contain the string "tqa" to be recognized by the evaluation server, but it is otherwise flexible. Evaluation and submission for this subtask are identical to the diagram question task, except that the text questions are scored. Questions requiring a diagram are not scored, and can be left out of the submission file if you would like to participate only in this subtask. Questions are separated by type in the dataset (nested under diagramQuestions and nonDiagramQuestions), and they also have global id prefixes to indicate an associated diagram (DQ_* and NDQ_*).